WASHINGTON (Reuters) - A group of 10 U.S. Senators introduced a bipartisan bill on Thursday to eliminate the corn ethanol mandate, arguing that current law raises the cost of food and animal feed and damages the environment. Feinstein said the bill supports development of advanced biofuels, including those from made from soybean oil, grasses and trees. But it would eliminate the mandate for corn-based ethanol, which currently represents the vast majority of biofuels produced in the United States. She said the corn mandate diverts a large proportion of the U.S. corn crop towards making fuel, raising animal feed and food prices. In 2012/13, over 4.6 billion bushels of corn was used for the production of ethanol and by-products, out of a drought-reduced total U.S. supply of 11.9 billion bushels, according to the Department of Agriculture. "I strongly support requiring a shift to low-carbon advanced biofuel, including biodiesel, cellulosic ethanol and other revolutionary fuels. 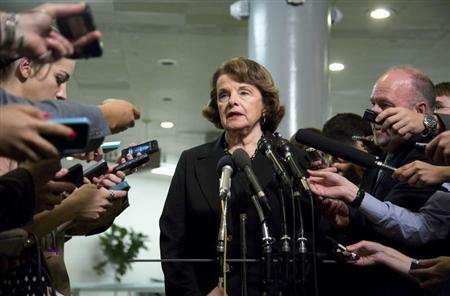 But a corn ethanol mandate is simply bad policy," Feinstein said in a statement. Coburn said the corn ethanol mandate costs taxpayers billions of dollars and causes higher fuel prices at the pump. "Eliminating this mandate will let market forces, rather than political and parochial forces, determine how to diversify fuel supplies in an ever-changing marketplace," Coburn said. The ethanol industry suffered a blow last month when the Environmental Protection Agency, which administers the RFS, proposed the first cut in the use of biofuels since the law was expanded in 2007. The EPA proposed cutting the overall 2014 mandate to 15.21 billion gallons, about 16 percent less than the current 2014 mandate's 18.15 billion gallons, and below this year's requirement of 16.55 billion gallons.